It's obvious that it's cheating on you. "If you crash while recording, these CPU's aren't faithful". Need to soften it a bit so oceans stop flashing on and off. I've come to the conclusion that 16x16 is just too small for me, so I've tried going 32x32. Tell me what you guys think! I LOVE these new textures. Especially the wood! I do have a suggestion for the stone tho. I'd try adjusting your palette gradient so that your darker pixels are a bit more dark. 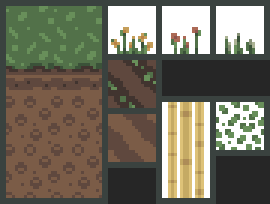 I think these textures would match up better with your wood if their darkest pixels were about 33% darker. Since, the "Simple Pack Showdown" thread runs pretty bare, I figured it wise to post these blocks in this location for criticism. Most oddities with color selection are beyond my control, as this competition demands no modification of user-submitted palettes. 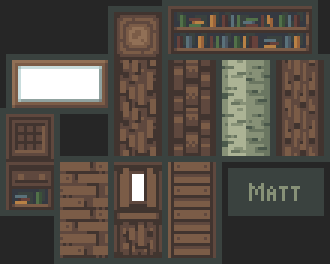 Any suggestions on how to make doors in this style and at this resolution [16x]? After the other planks and logs, they stand next on the agenda. For that matter, any blocks not yet completed are probably just so because I anticipate they will cause me trouble. So, throw some suggestions at me. Everything looks great! 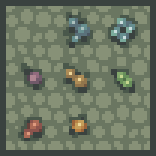 It is a bit hard to differentiate between the lapis and diamond ore, maybe change the shape a bit for one of them. I would look back at halucid's post that he did referring to some textures he created like doors and wood, some great inspiration there. We haven't been doing the emblems thing for a while now, but you are free to post on here if you have textures to show. These days, TAU is mostly a place for artists to get feedback on their work. Anyone know how to randomize the tops of the snow layer model using the vanilla model format? It doesn't work like regular random (alternative) textures, it ends up rotating the entire model. I put the rotation values only on layer 1 of snow (the first layer generated by the world) and it rotates the entire model sideways. What do you mean? It should work the same; just make sure to do them to the correct metadata! You're rotating the snow along the x-axis by mistake. Remove the lines with x-rotation and leave the y-rotation in. 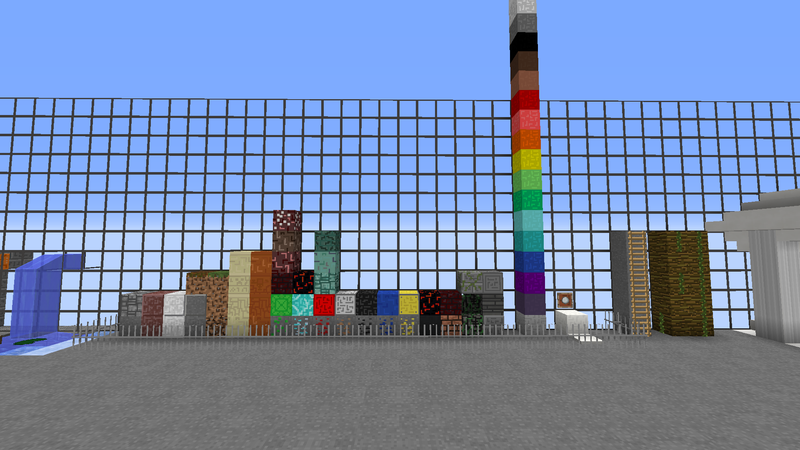 Started various blocks, first the mob spawner. Too busy, IMO. The wire is so small that it causes tiling issues. I think you should make some of the middle holes bigger, like taking that 5-pixel X in the middle to make a bigger diamond. Maybe keep that pattern in a few places (like the edges and possibly the middle) just to try to get an even pattern of whole bigger diamonds. Maybe for the bigger diamonds you could make it 2px wide, too. 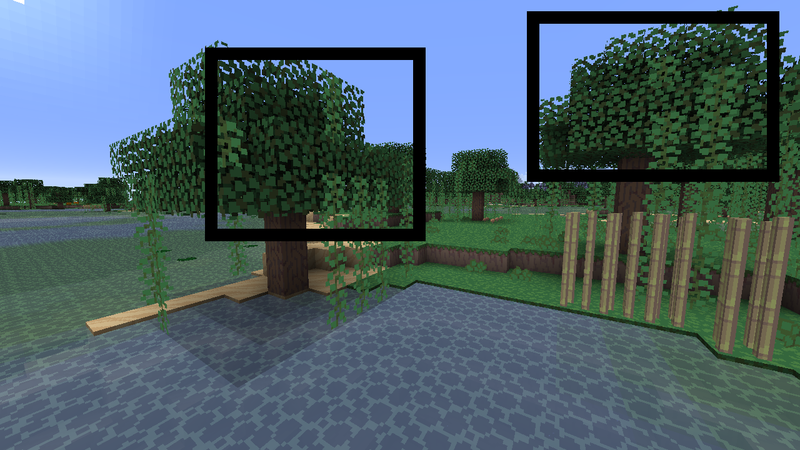 Question: why are my vines a different colour from my leaves when the actual texture uses the exact same colours and all biome colouring has been disabled? I think it could be because of ambient occlusion. The sides of a block are always darker than the top, and two of the sides are darker than the other two. So if I'm correct, the color of your vines and the color of the top of your leaves must be the same. In fact, the leaves in the left square are darker than the ones of the right square. It's easy to notice if you compare them with the vines. 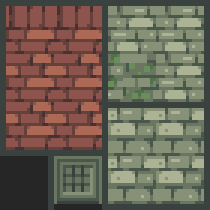 Solution: use darker colors for vines, if your palette lets you, obviously. Oh shoot, completely forgot about block shading! Looks like it's experiment time then, hopefully I'll be able to get a colour that's somewhat similar to it at least. Thanks for the help, buddy! If changing the block shading doesn't work you could try using mcpatcher to colour it, if you haven't already. To my knowledge swamps use hard coded colouring ignoring the default colourmap. Not sure if they still do. Haven't been texturing for a pack in over a year so my knowledge might be outdated. They do use hardcoded colours but disabling the biome shading from the models completely removes it as well. I made it darker and it's a lot closer but I won't be able to get it to match up with my palette since it's for the simple pack challenge. Ah well, nothing I can do about that! Spruce wood on the bottom left. 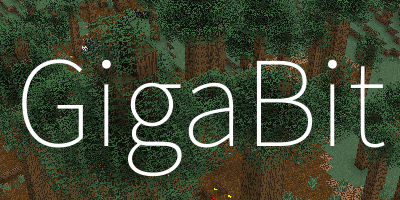 Cool, what would you add to a model file to disable biome shading? It doesn't really matter, it will affect everyone's vines the same anyway. Remove "tintindex": 0 lines. 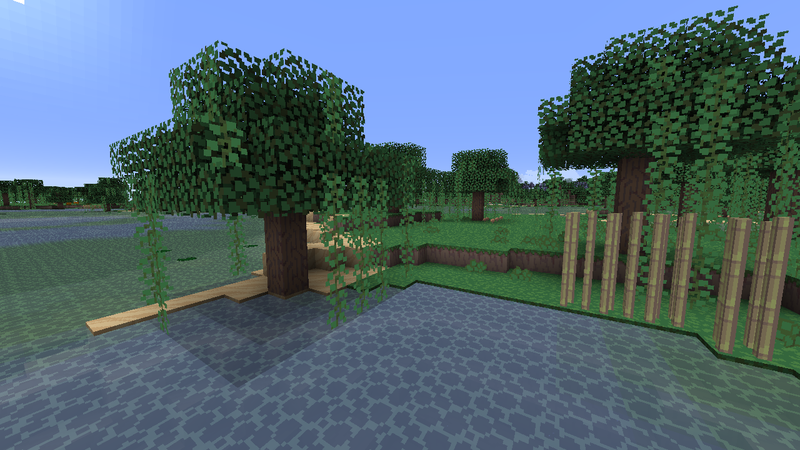 Although personally, I wouldn't do this for 1.8 simply because there are WAY too many models for vines. A while after I suggested it I did post this thread, it was much better (and more acceptable to the devs I'd assume) and that AFAIK accomplishes what the multi-part system as-previewed does, but also touches on not hardcoding states, excluding specific blockstates from a "multipart" configuration, a "pseudo" normal state that can be turned on and off per-blockstate, plus more examples. 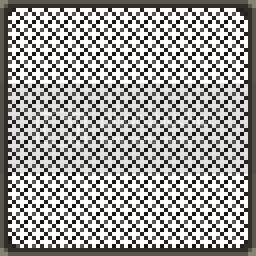 I'm just hoping that something like a "normal pseudo-state" exists (as exampled in my thread with replicating my current 1.8 redstone model with a part system), or when it comes to things like potted plants you won't be able to make it multi-part where it can inherit the pot model and plant models dynamically like it should be possible. Specifically I worry because they seem to shoot for "the most efficient solution" when it comes to the resource pack system rather than what's best for the resource pack format itself: being easy to achieve a desirable result. When we need MCpatcher for CTM that's one thing, but when we need it to change things that are hardcoded for no apparent reason (especially like the swamp that was at least somewhat changeable in the past) that's an issue. Plus we're in the same boat for the future as modders, how is it going to be useful to them if it's a pain for us to use? Doing just an "apply" without a "when" allows for an element that will always apply. Still not sure if there is any way to disable that though, like my exclusions for redstone models in 1.8. You could make 3D models for vines and enable ambient occlusion on them. 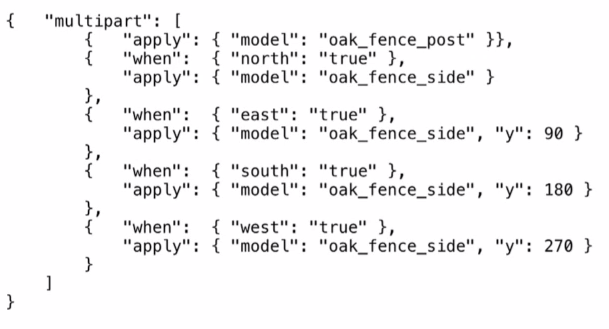 There are a lot of models for vines, though. I love them . You could add more shading to cobblestone though.